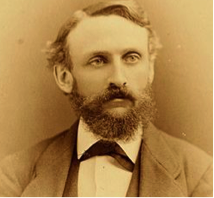 Edward Rowland Sill was a 19th century American poet, newspaperman and teacher. He was born on the 29th April 1841 in Windsor, Connecticut. Both of his parents died while Edward was a young boy so he was raised by an uncle in Ohio. Despite this major early setback he was well educated and studied at Yale University, graduating from there in 1861. His ability as a poet was recognised by the annotation of the title “Class Poet” and a fellow student referred to him, in his personal diary, as “a genius”. Like many other students, before and since, he became a “bonesman” of the “Skull and Bones” college secret society, an organisation that exists to this day. On leaving Yale, Sill was uncertain where his future lay and he tried his hand in the Californian business world first before enrolling himself into the Harvard Divinity School in 1867. However, a life as a clergyman was discounted in favour of journalism as he took up a staff position with the New York Evening Mail. His itchy feet then took him to Ohio where he held two teaching posts between the years 1868-71, and then a further move took him back to California where he was appointed principal of Oakland High School. Sill’s academic life went on for a number of years and included a spell at the University of California as professor of English literature. His health had been poor before moving to the west coast and, sadly, it began to decline further to the point where he had to give up teaching and move back to Ohio in 1883. This proved to be his final move. He settled in Cuyahoga Falls, one of the locations where he had previously enjoyed teaching. From this point on, he decided to devote himself to writing and between that time and his early death his output was prodigious, although relatively insignificant in literary terms. Edward Rowland Sill died in Cleveland, Ohio on the 27th February 1887, aged 45. He had been in hospital for an unspecified operation.